CAN I MAKE A CLAIM FOR PAYMENT PROTECTION INSURANCE IN SCOTLAND? If you have taken out a loan or credit card in the last 10 years, you were probably sold a policy to protect your payments if you were unable to pay. This is Called Payment Protection Insurance and can be very expensive. The Financial Services Authority (F.S.A.) have ruled that many of these polices have been mis-sold, which means you can make a Payment Protection Claim to have the cost of the insurance refunded. YOU MIGHT NOT EVEN REALISE YOU WERE MISSOLD? There are many ways you could have been missold. Speak to one of our specialist advisors Today. Within a few minutes they can tell you if you can claim your Payment Protection Insurance back. We work on a NO-WIN NO-FEE basis …… You’ve nothing to lose! Our average successful claim pays out £3500 within 8 weeks! 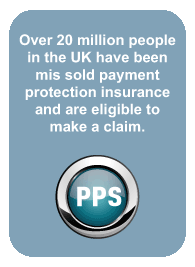 PAYMENT PROTECTION SCOTLAND is one of the most experienced PPI claim companies in Scotland . Just 1 Call and We’ll do Everything Else - CALL US TODAY!